Riad Diana - Luxury Riad in Morocco. Book Riad Diana Today with Hip Morocco - Holiday Accommodation in Marrakech, Morocco. "A beautiful modern riad in the medina with a beautiful ambience"
Located in Riad Zitoune, one of the best quarters in the central Medina of Marrakech, Riad Diana is a modern riad with traditional hand-crafted Moroccan decorations. Once you leave the door, you will be directly at the south end of the souks, less than 500 meters from the famous Jemaa el Fna square. 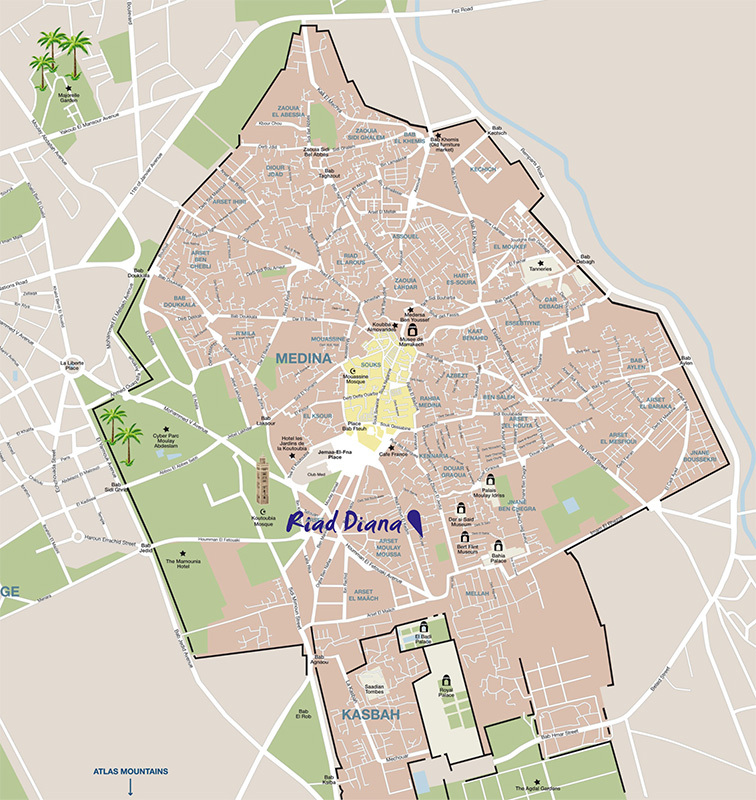 However, once at home within the riad, you will appreciate the calm, safe and also central location of Riad Diana. The bright and open Patio of Riad Diana is the central place to sit, to eat, to meet or simply to relax. Even during a hot summer day you will feel the fresh atmosphere at the Patio with his large swimming pool. In the colder seasons, you will also enjoy that the pool is heated. On the first floor you will find the main guest-room area. From here you can overlook the Patio on the ground floor and see the ever present blue sky of Marrakech. All 5 spacious guest-rooms are decorated in a modern style with reference to traditional Moroccan design with artisanal handcrafted decorations. Each room features WiFi, air-conditioning as well as central heating for the colder months. Our large double terrace offers a unique view to the Koutoubia Mosque and the Atlas mountains beyond, Here, you can relax on the sun beds after your excursions in Marrakech. In the morning, a varied breakfast or brunch will be served wherever you want, either on the terrace, in the Patio or in your room. For dinner we recommend our traditional Moroccan cuisine, but there are many excellent local restaurant situated a short walking distance from the riad. Visit Riad Diana and you will feel like a member of our Moroccan family from the first moment of your stay. In the morning, a varied breakfast or brunch will be served wherever you want, either on the terrace, in the Patio or in your room. For dinner we recommend our traditional Moroccan cuisine. "My friend and I stayed at Riad Diana in August and had an absolutely wonderful time! The staff were so helpful and friendly. We did the cooking class, had massages, had a private half day tour and a camel ride in the Palmeraie, which were all organised by Riad Diana. Even with the high temperatures, we really enjoyed relaxing on the rooftop of the riad and then dipping in the plunge pool. The entire place is extremely relaxing and made for an excellent holiday. If we are ever back in Marrakech, we will definitely stay here. Thank you for an excellent trip!" "We stayed for 4 nights at the Riad Diana in Dec. 2013. The location of this hotel is perfect - in the Medina and yet on a calm/peaceful small street. It takes merely 5min to get to the big Square and all the souks. The service was great, always helpful - they even organise a day excursion for us. The suite in which we stayed was more than comfortable - two big rooms, a small entrance and a bathroom. Overall very nice holiday, friendly charming staff and good service. Big thanks to all the staff." "The staff at Riad Diana are delightful and helpful, making for a very comfortable stay in Marrakech. The rooftop terrace with wifi was a hit with all of us. The location is perfect for exploring the Medina. Overall making for a fun trip to the city." Riad Diana is perfectly located in the heart of the ancient Marrakech medina, close to the Saadian tombs, Palais de la Bahia and Palais el Badii. It is a short walking distance from a huge range of high class restaurants and many great things to do in Marrakech including the world famous Souks and the Jemaa el Fnaa square. This charming double room features a small fireplace and en-suite bathroom with a shower, it is situated on the main terrace with a spectacular view of the Koutubia mosque and the Atlas Mountains. The room consists of connecting rooms with a patio, air-conditioning, individual heating and private en-suite facilities. Room features: Air-conditioning, heating, WiFi, toiletries, bathrobe, hairdryer. This charming deluxe double room has an en-suite bathroom with a shower and is situated close to the heated pool and the hammam. It consists of connecting rooms with a patio, air-conditioning, a fan, individual heating and en-suite facilities. This bright and spacious deluxe double room has an en-suite bathroom with a shower, it is situated on the first floor overlooking the patio and pool. It can accommodate 1 extra bed on request. Triple room: Double and Single bed. This bright and spacious deluxe triple room has a large double bed, single bed, and en-suite bathroom with a shower. Talata is situated on the first floor overlooking the patio and pool. Two Double or Twin rooms. The luxurious and spacious Senior Suite, consists of two adjoining rooms, with fireplace, and en-suite bathroom with shower. Accommodating up to 4 persons Arba is an excellent family suite, while also being suitable for 4 adults. The second room can be viewed in the gallery of photos. The base rate price at Riad Diana is in pounds, euros, or Moroccan dirhams and exchange rates are approximate.